Protesters Killed During Demonstration Over Massive Bomb Attack In Kabul : The Two-Way Demonstrators had been marching on the presidential palace, protesting government failures after Wednesday's massive bombing and demanding the Afghan president's ouster. Then, police began to fire. 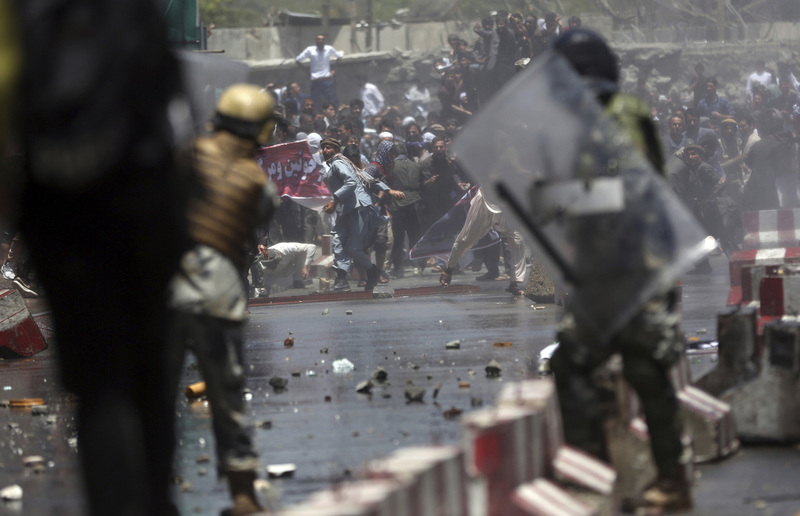 Protesters throw stones at security forces during a demonstration in Kabul on Friday. Several demonstrators were killed during clashes with Afghan law enforcement after gathering to protest the security situation in the capital after Wednesday's deadly bombing. Just two days after a car bomb tore through Kabul, killing at least 90 people and injuring hundreds more, demonstrators took to the streets of the Afghan capital in droves to demand the resignation of top officials. But even as the demonstrations called for better security from extremist violence, further violence arose Friday as security forces opened fire on the protesters. Several demonstrators died in the ensuing chaos. News reports cited Afghan officials who provided varying death tolls, ranging from two to eight people killed. "Hospital officials say some of the dead protesters had been shot in the head and the chest. "One of those killed was the son of an Afghan senator. His body, wrapped in a bloody sheet was briefly carried through the streets. "Afghanistan's deputy interior minister, Murad Ali Murad, says some of the protesters were carrying weapons, and that police fired in self-defense. He said Afghan security forces were wounded, as well." The protesters had been marching toward the presidential palace, demanding the ouster of President Ashraf Ghani and Chief Executive Abdullah Abdullah. The situation came to a head as many of them charged riot police, some throwing stones, according to The Associated Press, and police loosed a barrage of bullets in addition to tear gas and water cannons. 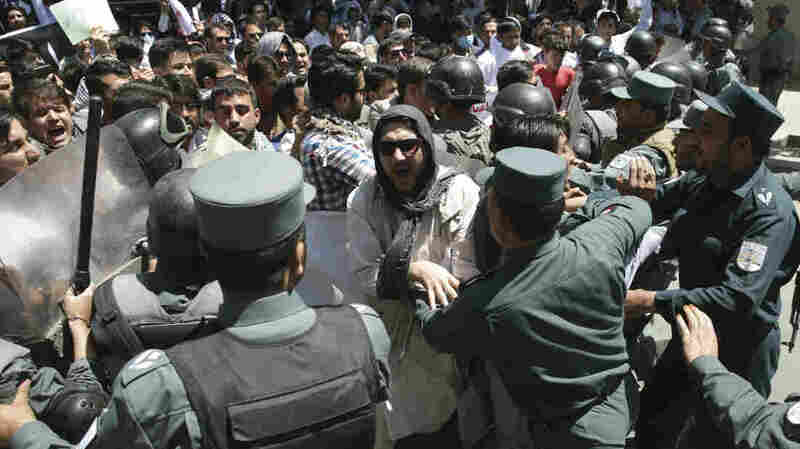 Police forces struggle against protesters during a demonstration Friday in Kabul, Afghanistan. President Ashraf Ghani denounced the violence as partly caused by "those who want to agitate and hurt public order." After the protests began, The New York Times reports, Ghani released a statement calling for peace but also blaming "those who want to agitate and hurt public order, their issue is separate — they will not be allowed to use the people's emotions against the people's interest." The demonstration had been prompted by the massive truck bomb Wednesday, which blew through morning rush hour traffic close to the German Embassy. At the time, Glasse reported that explosion was so huge, even "a mile away there was first a low rumble like an earthquake, then the shock wave from the blast followed and blew open doors and windows." "Closer to the explosion it shattered glass in homes, offices and cars," she added. In addition to the dozens who died, more than 450 people were wounded in Wednesday's attack. "Our brothers and sisters were martyred in the bloody attack on Wednesday," one protester told Agence France-Presse on Friday, "and our leaders are doing nothing to stop this carnage."